1080p is the shorthand name for a category of HDTV video modes. The number "1080" represents 1,080 lines of vertical resolution (1080 horizontal scan lines), while the letter p stands for progressive scan (meaning the image is not interlaced). 1080p can be referred to as full HD or full high definition to differentiate it from other HDTV video modes. The term usually assumes a widescreen aspect ratio of 16:9, implying a horizontal resolution of 1920 pixels. This creates a frame resolution of 1920×1080, or 2,073,600 pixels in total. The frame rate in hertz can be either implied by the context or specified after the letter p (or i), such as 1080p30, meaning 30 Hz. 1080p is sometimes referred to in marketing materials as "Complete High-Definition". However, 2K/4K digital cinema technology is commercially available, and ultra-high definition video is in the research phase. In addition to the meaning of 1080p as a display resolution, 1080p is also used to describe video equipment capabilities. 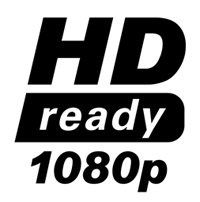 Use of 1080p and the closely related 1080i labels in consumer products may refer to a range of capabilities. For example, video equipment that upscales to 1080p takes lower resolution material and reformats it for a higher resolution display. The image that results is different from the display of original 1080p source material on a native 1080p capable-display. Similarly, equipment capable of displaying both 720p and 1080i may in fact not have the capability to display 1080p or 1080i material at full resolution. It is common for this material to be downscaled to the native capability of the equipment. The term "native 1080p-capable" is sometimes used to refer to equipment capable of rendering 1080p fully.